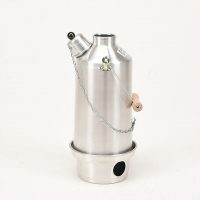 The Ghillie Kettle is designed for all outdoor acitvities ie; fishing, camping, music festivals, picnics and much more, (even power failure at home)! The kettle is a twin skinned vessel that holds the water between the two skins, place the kettle on its stand and fill with leaves, twigs, fir cones, paper, and boil 1.5 Litres of water in 3-5 minutes. A Ghillie Kettle will boil water in 3 to 5 minutes depending on the fuel you're using. Made from aluminium it is essentially a double-walled chinmney with the water contained in the chimney wall. Once the kettle is filled with water, simply start a very small fire in the base, set the kettle on the base and drop additional fuel (twigs, leaves, grass, paper, etc.) down the chimney. The large internal surface area of the chimney heats the water very quickly. When the water boils, hold the handle at an angle of 90° to the Kettle - then lift the Kettle clear of the base. To pour, lift it by the handle and tilt it using the whistle chain. 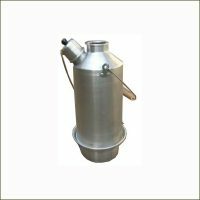 We have improved the Ghillie Kettle by supplying it internally cleaned, and supplied with our own design whistle to let you know when it's boiling. 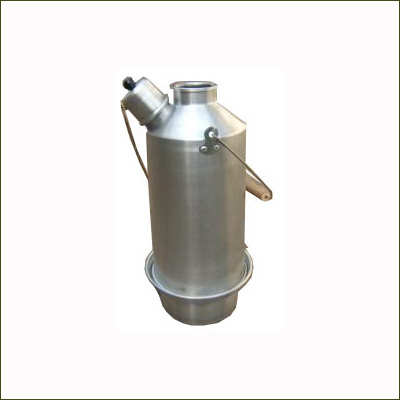 We are the direct distributor of this product, from a UK manufacturer in their 17th year of manufacturing these kettles. These are quality, British made products, not cheap foreign imports. Remember! If it hasn't got a whistle, its not a Ghillie. Please think safe and extinguish any fires with surplus hot water.